There are a lot of foods that hold great memories for me. I am sure I’ve talked about that before, and maybe that is the case for many of you. Of course during this time of year, where food is so important, I have the desire to make and eat a lot of those foods. 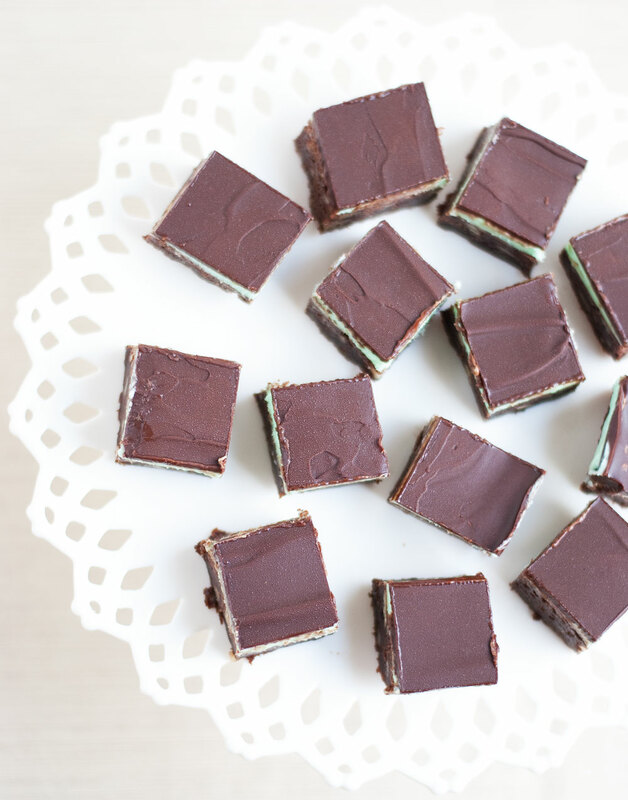 These peppermint bars are one of my favorite Christmas sweets that my mom makes and I’m happy to share them with you! 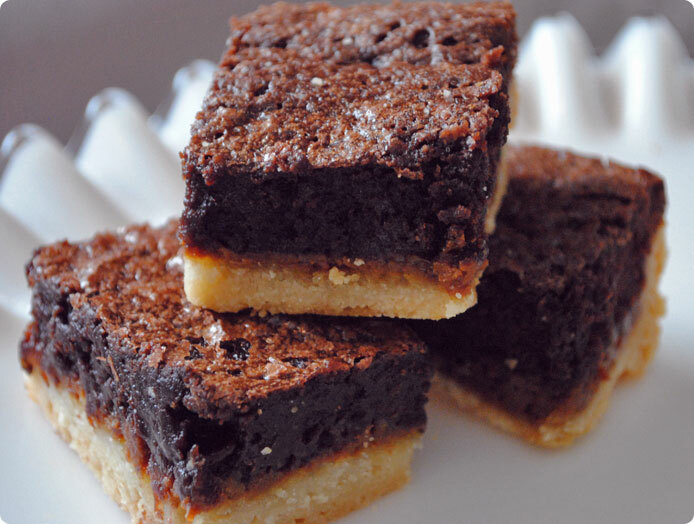 These layered brownies pack a punch and are best enjoyed cut into small squares. The bottom chocolate brownie layer is dense and decadent. The peppermint layer is sweet and smooth. The chocolate on top is bittersweet and a perfect contrast to the sweetness. I used to sneak these from the freezer, they are delicious after warming up just enough to be chew-able. They are also quite good at room temperature, just a little messy. But licking chocolate off of your fingers isn’t all bad. There are a few tips that make baking and serving these easier. Line the pan with foil and butter it well. 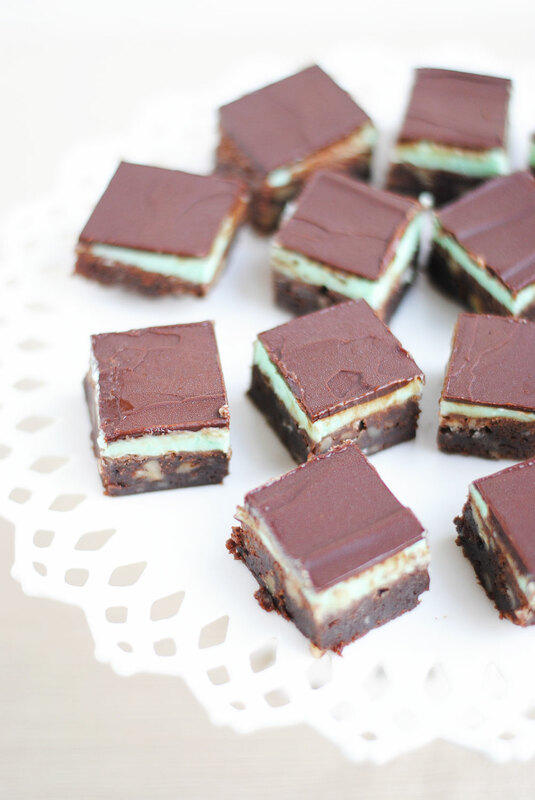 Use an offset spatula to spread the mint and the chocolate layers. 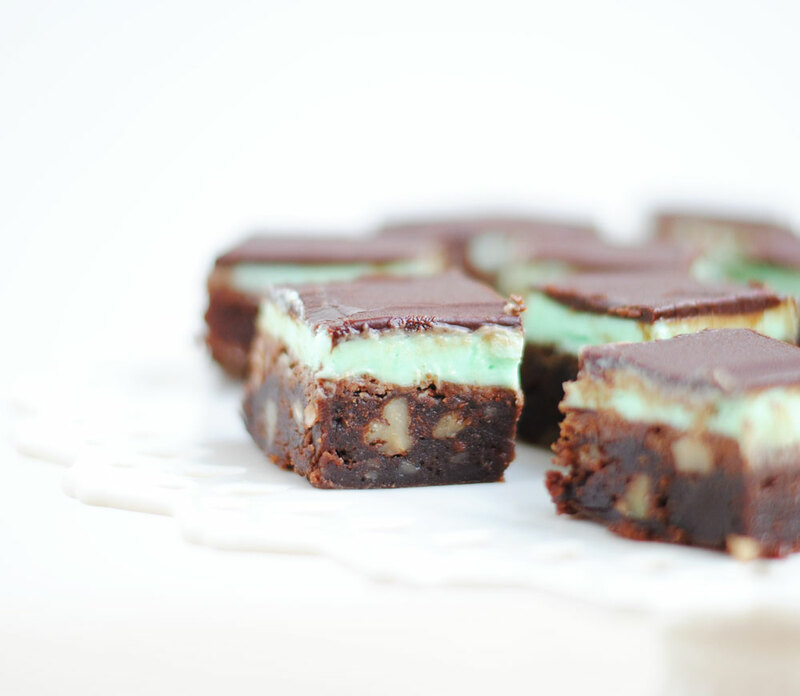 Chill the bars well after the mint and chocolate layers. Remove from the freezer and let the bars warm up for about 30 minutes before cutting, if you cut them frozen the chocolate will crack. Use the foil to lift the bars out of the pan and place on a cutting board. Use a warm knife to cut into squares, wiping it clean after each cut. At that point either serve or carefully repackage the squares and chill or freeze to serve later. These are a perfect dessert buffet addition, and they would also make a great addition to a cookie plate along with other cookies. I hope you try these and enjoy them as much as I do. Preheat oven to 350°F and prepare an 8-inch pan by lining it with foil and buttering the foil. Melt chocolate and butter over low heat, then set aside. Combine eggs and sugar in a large bowl and beat until light in color and fluffy. Stir in flour, chocolate mixture and nuts. Spread into the pan and bake for 20-25 minutes. Allow to cool for room temperature. Beat together powdered sugar, butter and milk until smooth. Mix in peppermint extract and a couple drops of food coloring to achieve the color and shade that you’d like. My mom always did green or pink. Spread evenly over the cooled brownies and place in the freezer until set, at least 30 minutes. Melt chocolate and butter together. I do this in the microwave. Chop the chocolate roughly and cut the butter into chunks. Combine in a microwave safe bowl and microwave on high for 15 second increments, stirring well in between until melted and smooth. Remove chilled bars and pour the chocolate on top and tilt the pan to spread the chocolate around. Use an offset spatula to even out the chocolate if needed. Christmas is fast approaching and while my shopping is mostly completed and our tree and lights are up I feel like I have a lot of cooking still to do. I’m excited to make some of the nostalgic cookies that bring me right back to my childhood, but I always like to try my hand at something new. So along with some reliable and time-tested recipes, I’ll also share some new ones that would be perfect for the holiday season. I have a thing for rosemary. An herb that is lovely in savory dishes but really gets along well with sweet flavors, rosemary is also incredibly easy to grow. In fact, the rosemary plant I thought was dead and moved to the side yard to die a slow death is doing better than the one I have been caring for on the back porch. That should give you an idea of my gardening skills. The blog is already full of sweets that feature rosemary, but that isn’t stopping me from sharing another one with you! 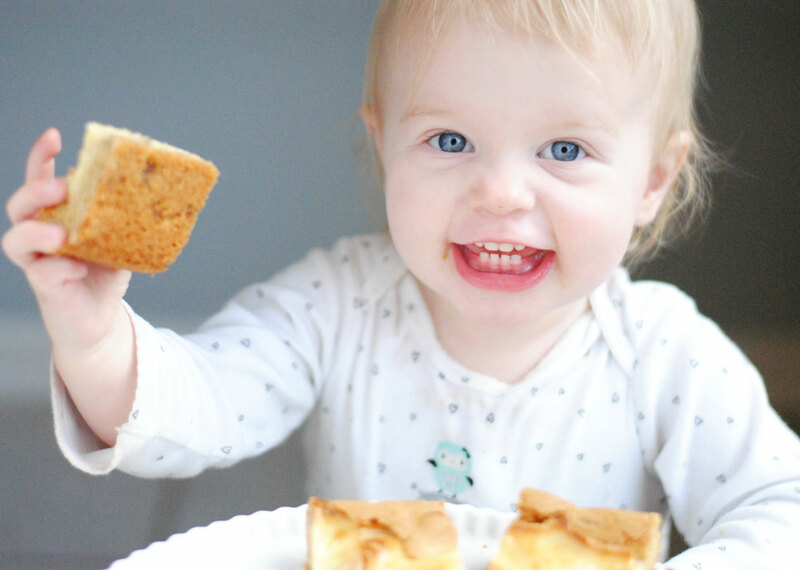 These blondies were a big hit with my husband, who prefers his sweets more on the savory side. My 4-year-old was not a fan. My 2-year old ate them up happily, a girl after my own heart. It has butter and sugar in it? We are in. Brown butter and dark brown sugar make these blondies quite rich. Add pecans and rosemary to the mix and the flavors are all warm and rich. 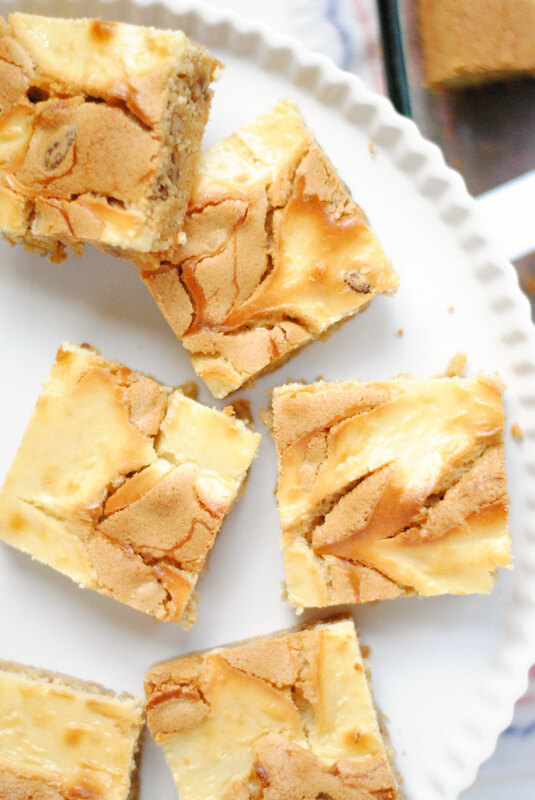 The cranberries are a welcomed sweet-tart addition that make these blondies more balanced and super delicious. I went heavy on the salt and rosemary, but realize that not everyone has my taste buds. Opt for less salt and less rosemary if you’re skeptical. Then if you think it needs more you can adjust the next time. I usually say it’s better to have too much than not enough, but that’s not the case with those ingredients. Brown butter: Place butter in a small saucepan and heat over low-medium heat until butter begins to sizzle and spit. Reduce heat to low, watch closely and swirl the pan occasionally just until butter smells nutty. Pour into a bowl and let cool slightly. Preheat oven to 325°F and butter a 9×13 pan. Whisk flour, baking powder, salt and rosemary together in a small bowl. Beat cooled butter and brown sugar together. Add eggs and vanilla and beat well. Mix in flour mixture and then the pecans and cranberries. Spread batter into the pan and bake for 20-25 minutes. Cool before cutting and serving. I spent last weekend in Richvale, California for my cousin’s wedding. My mom grew up there. It’s a small rice farming town where quite a few of my cousins are carrying on the rice farming business. I was able to visit with a lot of family this weekend, many of whom remember me as being “just this big!” the last time they saw me. The last day we were there we had brunch with my mom’s cousin’s family and a few other people. Their daughter is a senior in high school and we started talking about baking. 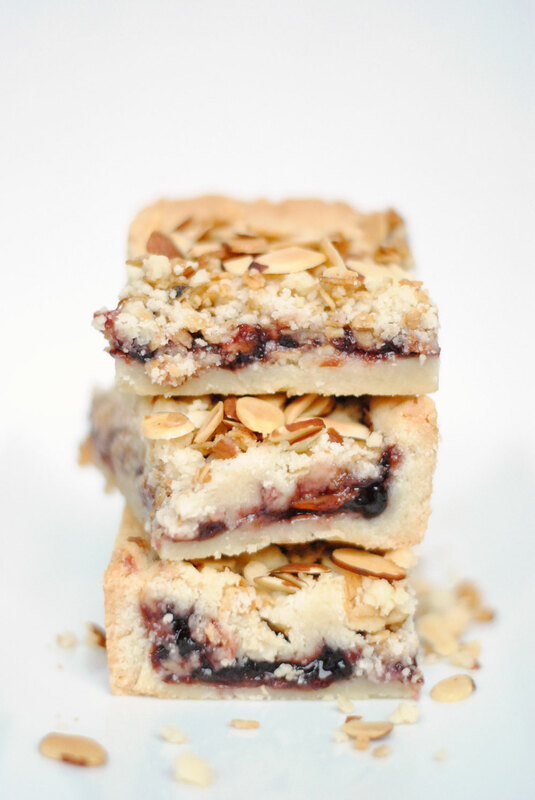 She said one of her favorite things to make were these jam bars that had granola on top. I asked her where she found the recipe and she said it was from a Barefoot Contessa cookbook. As luck would have it I was able to find the recipe on food network’s website. Thanks for sharing this recipe, Emily! It is truly amazing. 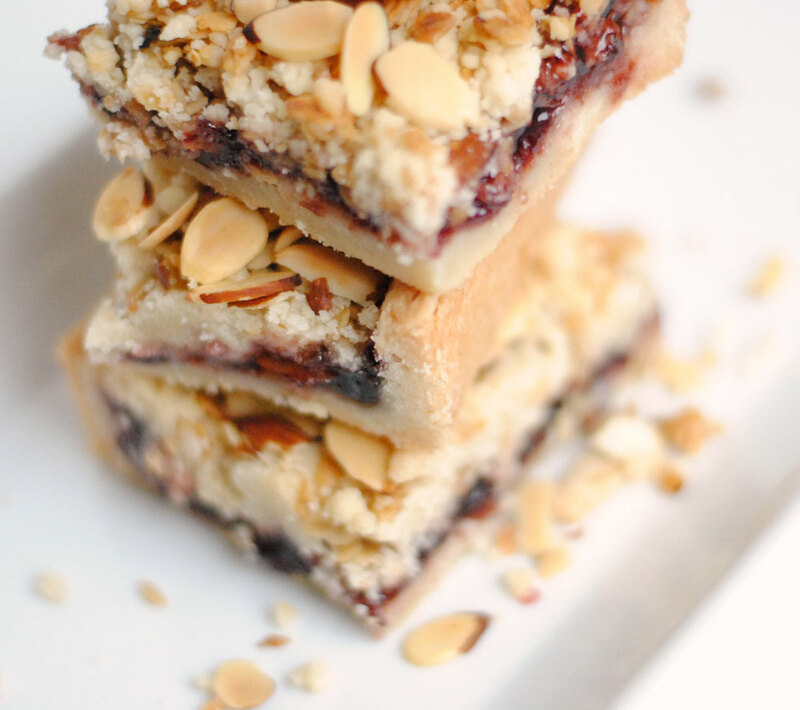 You can easily make these bars your own by using your favorite jam, your favorite granola or your favorite nuts. I used Hero black cherry jam, an almond vanilla granola and sliced almonds. These come together quickly, bake up beautifully and, once cooled, slice up wonderfully. The crust is thick enough to keep them sturdy. 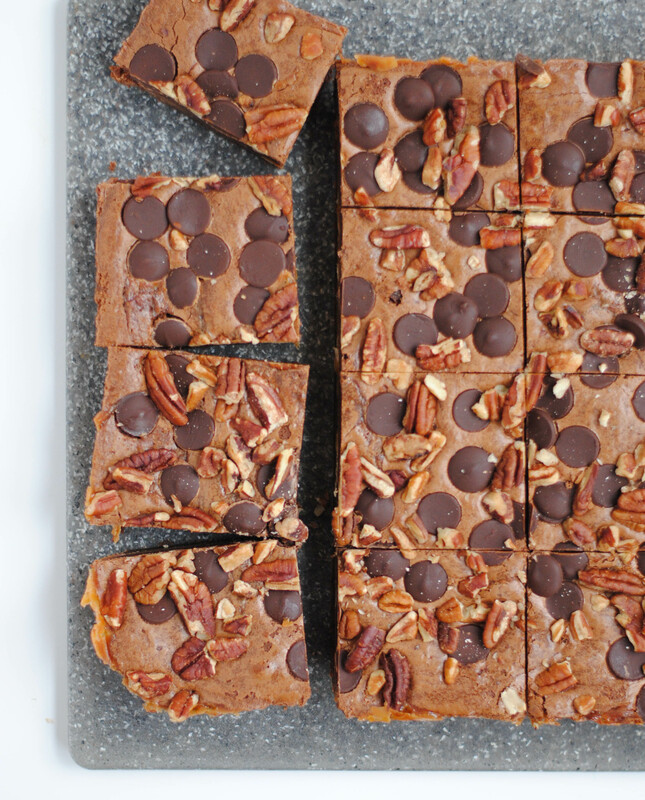 I cut my 8-inch square pan into 9 squares, but that makes for a hefty bakery-sized serving. Which is really fine by me! But you can cut the pan into 12 squares or cut larger squares into smaller ones after taking them out of the pan. Beat butter, sugar and salt in the bowl of a stand mixer (or with a hand mixer) until combined. And in the vanilla and beat. Whisk the flour and salt together. Add the flour mixture to the butter and mix on low until it just comes together. Remove about 1 to 1/2 cups of the dough. Pat the remaining dough into the bottom and about 1/4 way up the sides of an 8-inch square pan. Spread the jam onto the crust, but not onto the edges. Mix the reserved dough with the granola then evenly spread over the jam. Sprinkle with the almonds. Having kids has somehow made it ok to for me to purchase certain kinds of cereal. Lucky Charms is usually the one I fall for, and Carson loves it, of course. But a while back I just had to buy a box of Fruit Loops. I loved them as a kid. It made the milk turn a lovely pastel color and made the milk taste super delicious, like most sugary cereals do. I thought the kids would LOVE it. Both of them refused to eat it. I guess that’s good, but it did mean I had a huge family sized box that was just begging to be made into something delicious. 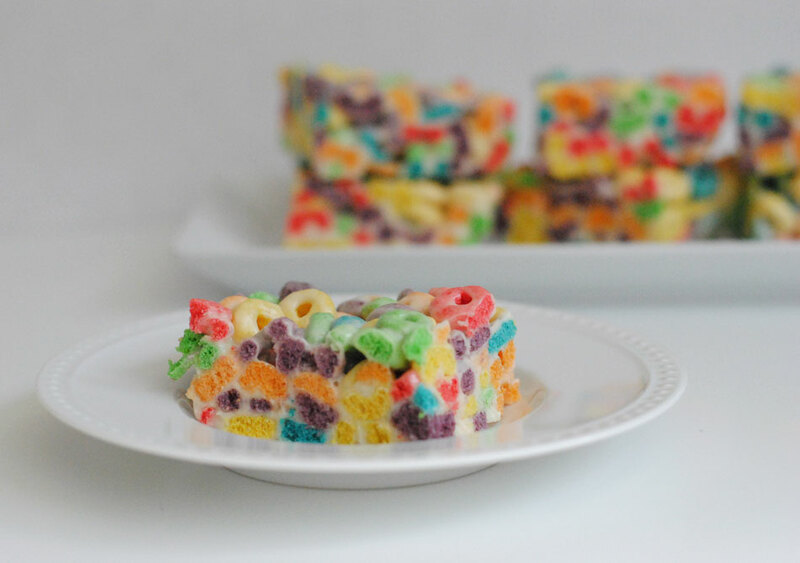 With a couple of bags of marshmallows in my pantry it was an easy decision to make Rice Krispy Treats, only with Fruit Loops. I think these are beautiful! The colors are just a lot of fun. When Ben saw these on the counter he said, “Ewww.” He isn’t a big fan of super sweet treats, so the combination of sugar cereal and marshmallow doesn’t appeal to him in the least. They are a little over the top, I’ll admit. And they are sweet, a small square is just enough. I think they’d be a great little treat at a kid’s birthday party. But they’re also a nice little treat for adults as well. Butter a 9×13 inch pan and set aside. Melt butter and marshmallows over low heat in a large pot until marshmallows are melted and the mixture is smooth. 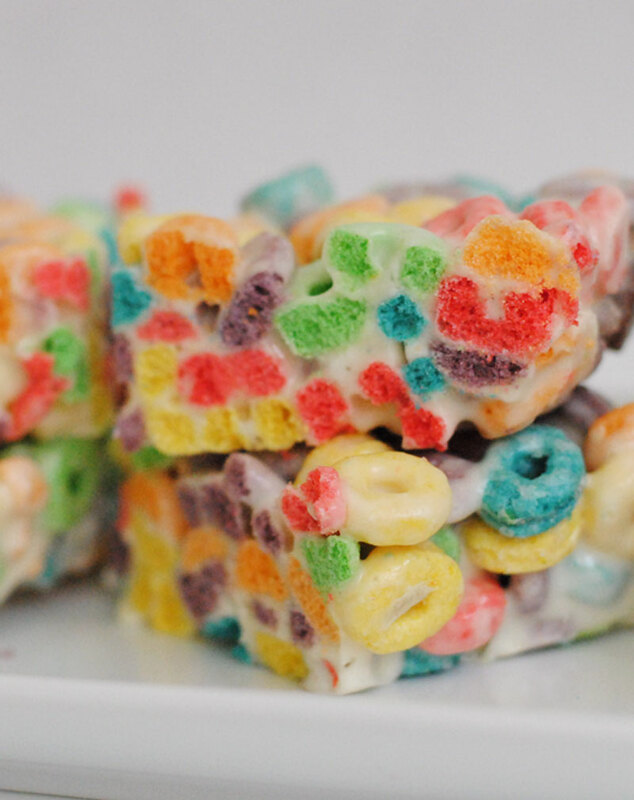 Add in the Fruit Loops and mix well to coat all the cereal. Pour the mixture out into the pan, then butter your hands and press mixture out evenly. Let cool, then cut into squares. More than a few food bloggers I’ve read in the last couple of days have mentioned being done with chocolate. After Valentine’s Day I was in the same boat. And while I had the desire to bake something sweet and delicious I knew I needed to steer clear of cocoa. 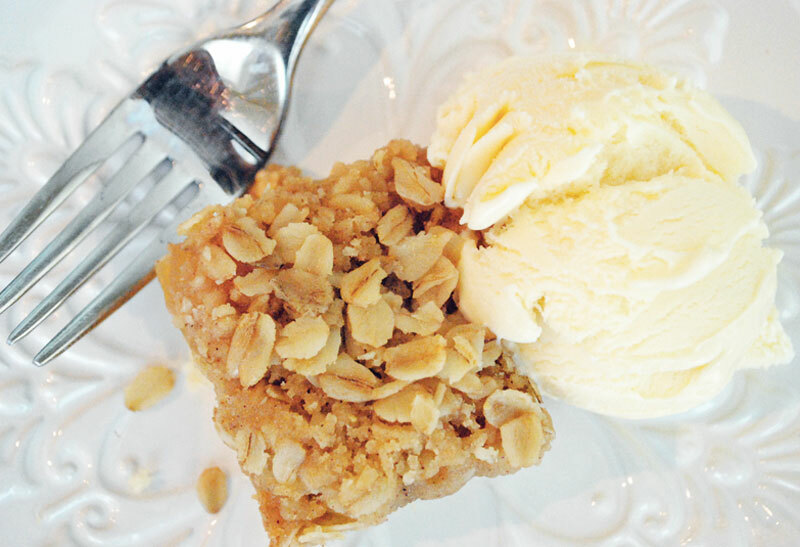 These blondies were the perfect compromise. I love blondies, maybe, just maybe more than I love brownies, but it depends so I can’t say for sure. 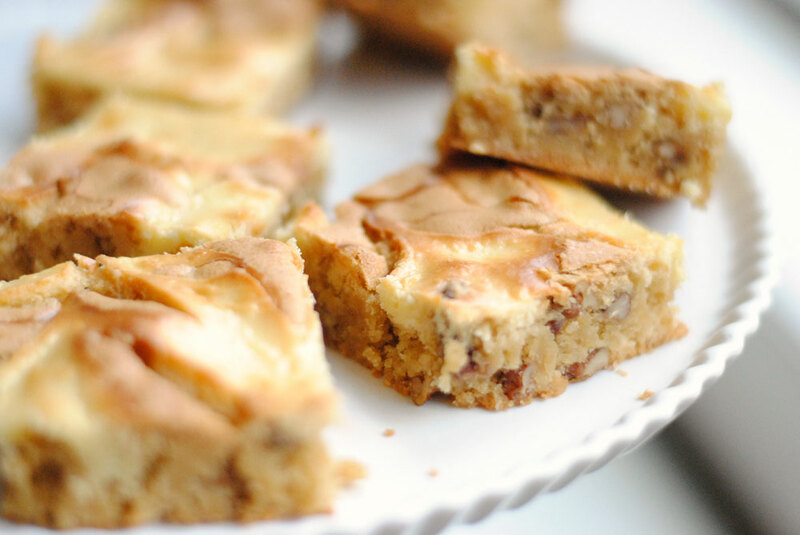 These blondies have a cream cheese swirl and pecans to make them even more delicious. The top and edges get crispy and crunchy while the inside stays moist and chewy. It’s a glorious combination. You can substitute walnuts for the pecans, or leave the nuts out altogether if you’re just not a fan of nuts or if you have an allergy. 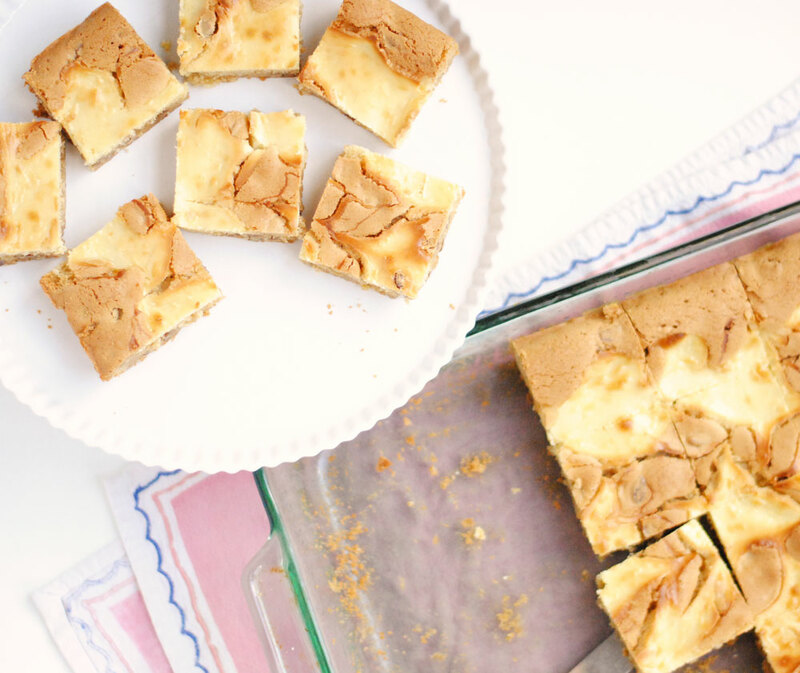 The blondie batter can even be used on its own without the cream cheese. 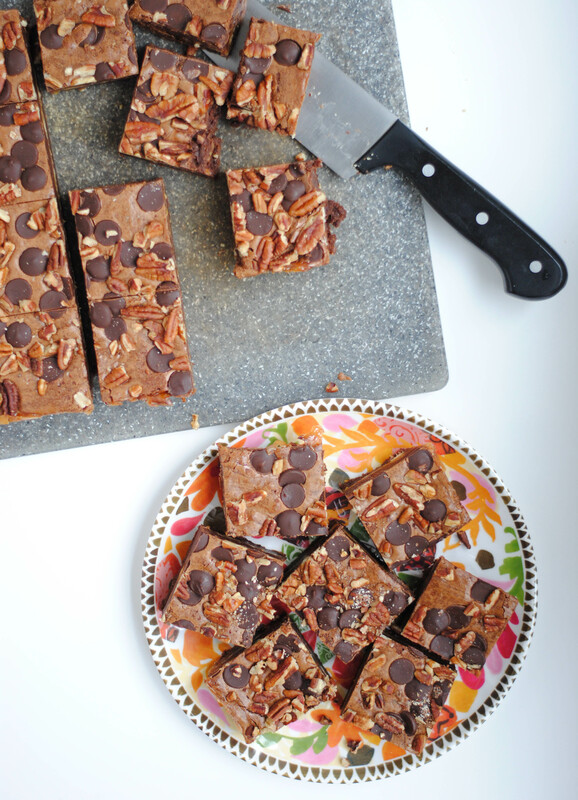 You could mix in white or dark chocolate chips, toffee, or whatever you’d like. The recipe calls for cake flour, and while I think all purpose would be OK, I haven’t tried it out. Let me know if you come up with any spectacular combinations! These are wonderful on their own, but also quite nice with a scoop of vanilla ice cream. But really, what isn’t nice with a scoop of vanilla ice cream? “Enjoy!” says Betsy. Preheat oven to 350°F. Grease a 9×13 inch pan and set aside. Beat butter and sugar together in a large bowl until well combined and light in color, 2-3 minutes. Beat in the eggs, one at a time, scraping down the bowl as needed. Then mix in vanilla. Add in the four mixture and mix to combine, then fold in pecans. Pour into the prepared pan and spread evenly. In a medium bowl beat cream cheese and sugar well. Add in the egg yolk, flour and vanilla and mix well. Drop cream cheese mixture in heaping spoonfuls onto the blondie batter. Use a knife to swirl the cream cheese through the batter without totally mixing it in. Bake for 35-40 minutes, until top is beginning to brown and cake tester inserted into the blondies comes out with just a few crumbs. Let cool to room temperature before cutting OR let cool for 20 minutes at room temperature then pop them in the fridge for half an hour before cutting. When it becomes seasonally appropriate I immediately start cooking and baking comfort foods. I cannot wait until it’s cool enough to cook a pot roast! This one. It’s beyond terrific. But it’s 85 in Houston today, so even though we are technically in the season of fall, it doesn’t feel like it here and the thought of having the oven on makes me uncomfortable. I know I shouldn’t complain because it’s not totally abnormal, this is what you get in Texas (certain parts of Texas at least…I miss you, Amarillo). But soon enough we’ll have highs in the 50s and I’ll be able to wear jeans without sweating and I’ll be able to make these for a party where everyone is in boots and scarves and sipping hot chocolate and frolicking in the leaves. These bars are simply perfect with their buttery shortbread crust, sweet apple filling and crunchy oat topping. The ingredient list is basic and they aren’t at all difficult. Served with some sweetened whipped cream or vanilla ice cream this is my idea of the perfect dessert. 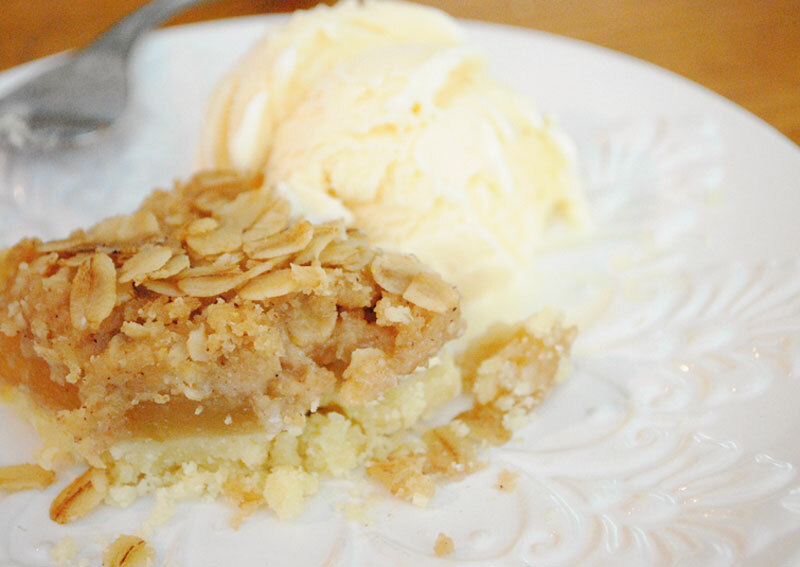 If you have an apple pie craving but don’t have the time to make one, these are a perfect substitute. I’ve used “perfect” three times so far. And they truly are wonderful. I want one right now. I tried them a second time with cherry filling and made a half batch. Half of them fell apart on their way from pan to plate, so I need to do some tinkering with baking time and some amounts. But they were delicious and everyone who tried them sang their praises. With the crust and topping you could use any kind of fruit filling, but the apple is nice for this time of year. Please share if you try out anything spectacular! Enjoy. Make the crust: Combine the butter, flour and salt in a large bowl and beat with an electric mixer until crumbly and well combined. (You can do this with a pastry blender as well.) Pat the dough into the bottom of a 9×13 inch pan so that it is even and firmly packed. Bake for 20 minutes, remove from the oven, and allow to cool for at least 30 minutes. Make the topping: In the same bowl, mix together the flour, brown sugar, oats, cinnamon and salt. Use a pastry blender to cut in the butter until mixture is crumbly and well combined, use your hands if necessary. Set aside while the crust cools. Place the apples on top of the cooled crust, spacing them evenly and leaving about 1/4 inch edge around. Spread any remaining sauce from the can evenly over the apples. Gently spread the crumb topping evenly over the apples, then sprinkle with the remaining 3 tablespoons of oats. Bake for 45 minutes, remove from the oven and allow to cool before cutting into squares. 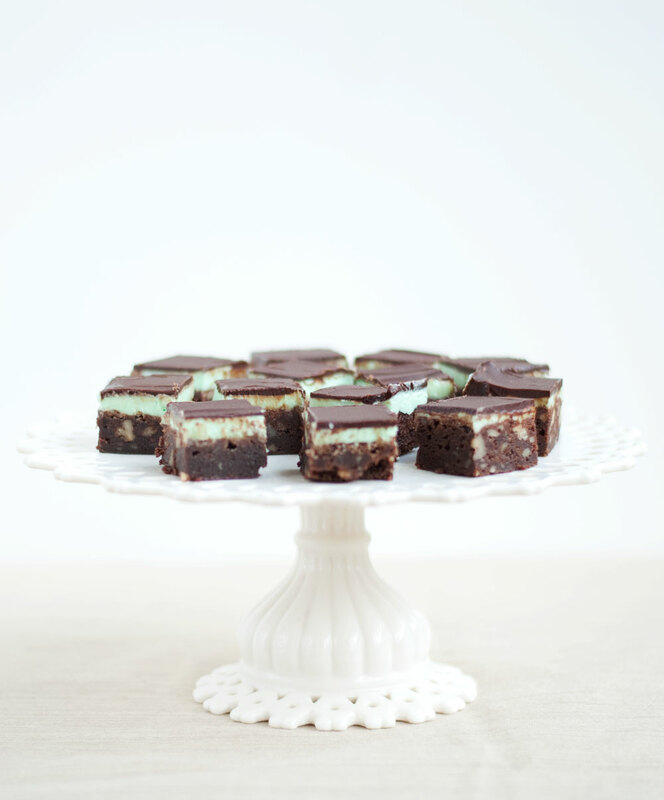 You have no doubt seen those bars on Pinterest, and floating around on the internet called slutty brownies. 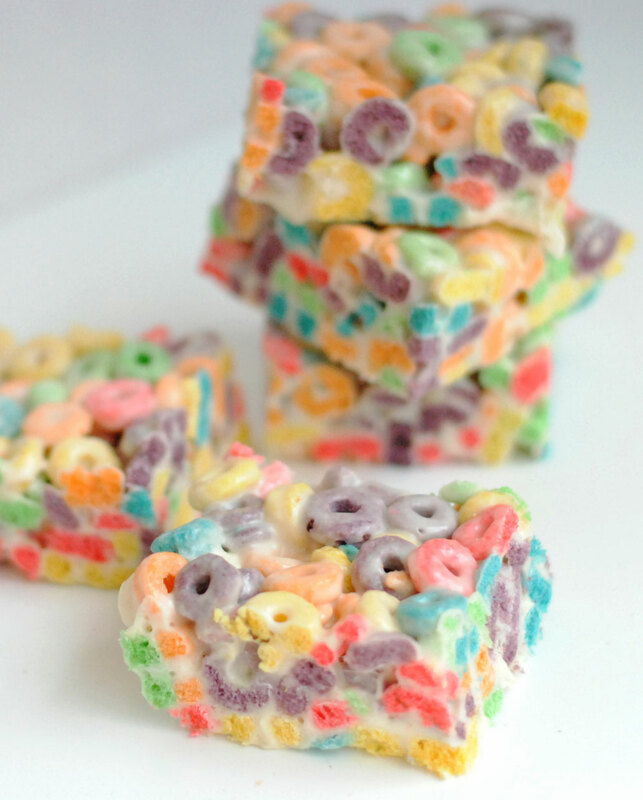 I saw them posted on Pinterest by one of the last people I would have ever expected to allow the word ‘slutty’ to appear before her eyes, much less repin a recipe with the word in the title. I immediately clicked on it when I saw her pin. These things are ridiculous, and I mean that in a very good way. A layer of Oreo cookies is sandwiched between a chocolate chip cookie layer and a brownie layer. They make my mouth water and I’m pretty sure that looking at them just made my yoga pants stretch out a little more than they already were. By the way, I did not do yoga in these pants today. In fact, I did nothing. Oh no, I vacuumed. That’s something. So here they are. 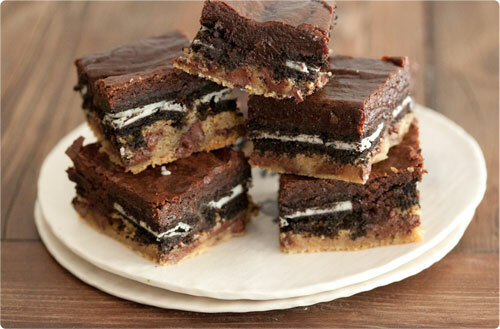 The slutty brownies. And don’t you see what I mean? Don’t you just feel a little fatter after looking at them? Anyway, the link I clicked on led me to the Londoner. She uses boxes of mix, which is totally fine in my opinion, especially with something called slutty brownies. The easier the better. Another recipe, from What’s Gaby Cooking, uses scratch made cookies and brownies. I typically don’t have that kind of time or patience, so I admire you, Gaby! Jessica Simpson is apparently craving these brownies during her pregnancy, and I don’t blame her. Now that you’re expecting to see how my slutty brownies turned out (and how much weight I gained after eating the entire pan), I did not actually make slutty brownies. I just wanted to talk about them. But I did make a three layered bar that brings together shortbread, dulce de leche and brownies. I made the shortbread cookie and used a can of dulce de leche and a box of brownie mix. I think they would have been better with a scratch brownie, which really isn’t all that hard to do and I wish I’d done it. Next time. Pulse all ingredients in a food processor until mixture resemble coarse sand. Do not overmix. Press mixture into a 9×13 pan (greased if desired, I did not grease my pan). Make sure to push the mixture slightly up the sides. When you pour the dulce de leche on top you do not want it to touch the sides of the pan or it will burn and stick during baking. Bake at 325°F for about 20 minutes. Let cool completely. Pour dulce de leche into a microwave safe bowl and microwave in 20 second increments, stirring in between, until it is smooth enough to spread easily. Spread dulce de leche over shortbread layer evenly, making sure it does not touch the sides of the pan. Sprinkle salt evenly and lightly over dulce de leche. Prepare brownie batter according to package directions and pour evenly over the dulce de leche layer. Bake at 350°F for 40-45 minutes. Check for doneness on the brownie layer and bake a little longer if batter is not cooked in the middle. Cravings are not something I get very often, but I had a serious craving for a nice fudgy brownie a few weeks ago. I am going to blame (and thank) my pregnancy for this. My pantry just so happened to be stocked with the perfect ingredients. A bag of candied ginger, some Lindt 70% cocoa chocolate bars (thanks, Lindsey!) and my newly purchased Maldon flaked sea salt that I had been very anxious to use. After adding some butter, sugar, eggs and flour, I had these bites of chocolatey goodness that perfectly satisfied my chocolate craving. 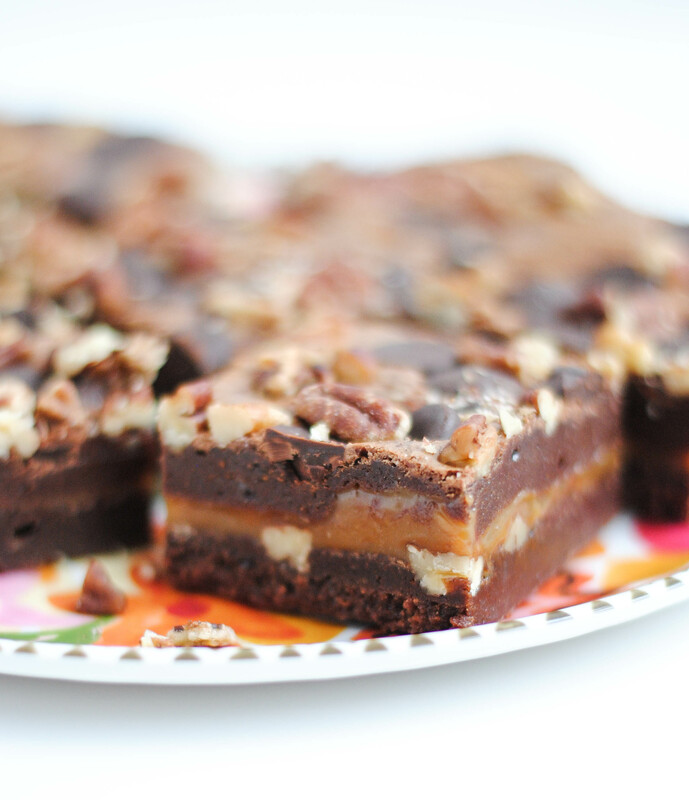 In searching for a recipe I found the sweet and salty caramel brownie in this Baked cookbook which is now on my list of things to make and not share with other people. 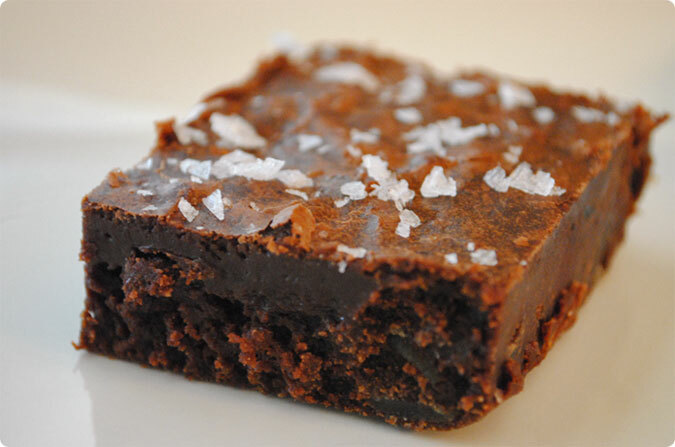 Since I didn’t have everything to make the caramel brownies, I used the basic brownie recipe and then added in some chopped candied ginger, chopped dark chocolate and sprinkled the brownies with some flaked sea salt before and then right after baking. I didn’t measure my salt. Use a light hand when sprinkling because a little goes a long way. The salt with the dark chocolate is so wonderfully perfect. And the ginger. Oh, the ginger. Leave it out if you really hate it, but it is subtle and delicious. I love the interest it added to this simple brownie. 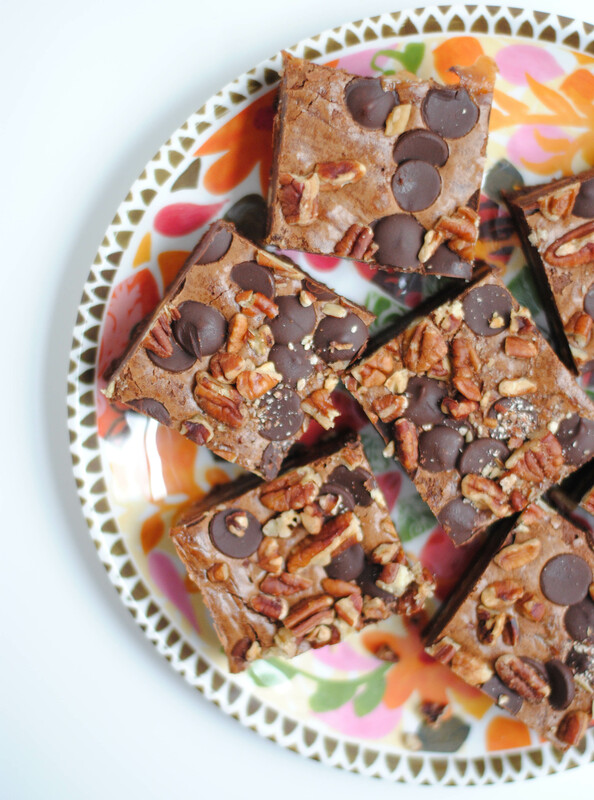 These brownies are very fudgy and dense, making them less than easy to remove from the pan. I did not use parchment in the bottom of my 9×13, as suggested. I just greased the pan generously thinking this would surely be enough to guarantee quick and safe removal. I let the brownies cool, and then chilled them in the fridge so they would be easier to cut. I think this little trick does make removing gooey brownies easier in general, but maybe they were a bit too cold. I had a few casualties that weren’t pretty enough to be served and had to be eaten…what a shame. It was kind of like cutting the first piece of pie that almost always falls apart and looks ugly. After you clear up that first row, things do get easier to cut and remove. Now, do not let all my negative talk deter you from making these! The little frustration involved in cutting these is definitely worth it in the end. Just use parchment, remove the whole pan of brownies once they’re cool, transfer it to a cutting board and use a large chefs knife to cut them. I still thing chilling them for a little bit helps, but it’s up to you. Use good chocolate, the chocolate is the main attraction. Cut these into small squares, they are rich. Give some away, or you’ll get sick. Store them in the fridge and let them warm up for a few minutes before enjoying. Grease sides and bottom of 9×13 inch pan. Line the bottom with parchment, leaving a little overhang on the short sides if desired, and grease the parchment. Place the chocolate and butter in the bowl of a double boiler set over a pan of simmering water, and stir occasionally until the chocolate and butter are melted. Turn off the heat and add both sugars. Whisk until completely combined and remove the bowl from the pan. Let cool for a few minutes. Add 3 eggs to the chocolate mixture and whisk until combined. Add the remaining eggs and mix to combine. Add the vanilla and stir. Do not overbeat at this point. Sprinkle the flour mixture over the chocolate mixture and fold it a few times. Add the chocolate and ginger and fold until a slight trace of flour remains. Spread batter evenly into the 9×13 pan, then sprinkle lightly with flaked salt. Bake for 30 minutes, rotating the pan halfway through. Stick a toothpick into the center to check for doneness, only a few moist crumbs should attach. Sprinkle immediately with a little more salt (a little goes a long way) and let brownies cool in the pan, then cut them into squares and serve. These really are my mom’s lemon bars. I’m not sure exactly where the recipe came from, but I think I remember her saying she cut it out of a magazine years ago, like before I was born years ago. 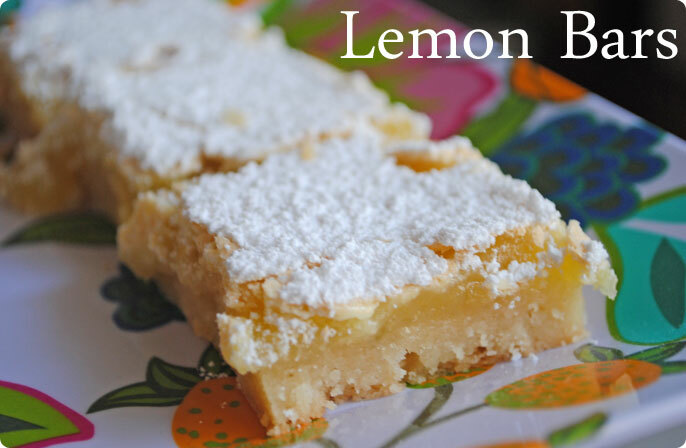 Lemon bars are one of my favorite bar cookies. The zesty lemon, the buttery crust, the gooey center with the crunchy top covered in powdered sugar. I love them, and I’m wishing right now I hadn’t sent so many of them up to Ben’s office! I didn’t grease my pan because I figured there is so much butter in there, they won’t stick. The crust didn’t, but some of the filling clung a bit to the sides of the pan. You could spray the pan with cooking spray or grease it, but it wasn’t a disaster without doing so. Do it if you’re worried about them sticking. Sift together flour, powdered sugar and salt in a large bowl. Cut in butter with a pastry blender until fine crumbs form and there are no huge chunks of butter. Pat the crust mixture into the bottom of a 9×13 pan. Bake at 350°F for 20 minutes. About 5 minutes before the crust is done baking, in the same bowl whisk all the filling ingredients together until combined and foamy. Pour filling mixture over warm crust, then continue to bake for 20-25 minutes. Dust with powdered sugar while bars are warm from the oven, then let cool completely before cutting.